I was talking with Ire Aderinokun today for an upcoming podcast episode and she mentioned I should use Lighthouse (It's built into Chrome, can be run as an extension, or run from the command line) to optimize my podcast site. I, frankly, had not looked at that part of Chrome in a long time and was shocked and how powerful it was! It told me about Accessibility issues as well, pointing out that some of my links were not discernable to a screen reader. Some of these issues were/are easily fixed in minutes. I think I spent about 20 minutes fixing up some links, compressing a few images, and generally "tidying up" in ways that I knew wouldn't/shouldn't break my site. Those few minutes took my Accessibility and Best Practices score up measurably, but I clearly have some work to do around Performance. 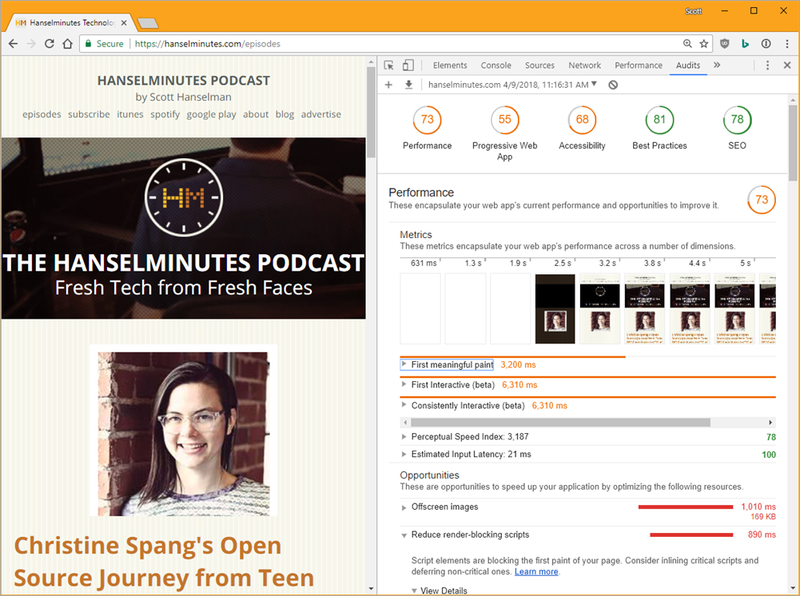 I never even considered my Podcast Site as a potential Progressive Web App (PWA) but now that I have a new podcast host and a nice embedded player, that may be a possibility for the future! My largest issue is with my (aging) CSS. I'd like to convert the site to use FlexBox or a CSS Grid as well as fixed up my Time to First Meaningful Paint. I went and updated my Archives page a while back with Lazy Image loading, but it was using jQuery and some older (4+ year old) techniques. I'll revisit those with modern techniques AND apply them to the grid of 16 shows on the site's home page as well. I have only just begun but I'll report back as I speed things up! What tools do YOU use to audit your websites? I am currently re-doing my site as well, for a lot of the same reasons. If you ever want to tag team on the CSS, I'd be game with a tag team session if you want. With regards to auditing of the code, <a @href="https://sonarwhal.com/">sonarwhal</a> which does much of what you mentioned above. It's great because you can build it into your build process (if you have one) and configure the rules to match that of your team's needs. @Scott, Latest browsers (except safari) know IntersectionObserver API, what is perfect for lazy loading scenarios.